The many bass combo amps for sale and the different features they come with might make it difficult when looking for the best bass combo amp. To simplify your decision-making process, we have examined the products that are popular among bass players and decided that the Fender Rumble is the first option to consider. The 500-watt class D power amp will provide musicians with a deep bass response and help them explore various bass tones in a lightweight unit. If you can’t find this product, you might want to consider the VOX PB10. Because the market is generous when it comes to bass combo amplifiers, finding the right one for your needs might prove a bit of a challenge. To ease your shopping, we have compiled a list of bass combo amps reviews based on the most appreciated products in this line and the features they come with. The first product to consider when looking for quality guitar amps is the Rumble model from Fender. If you’re interested in high-performance and portability, then you should not miss out this amp when exploring the market. Providing the classic Fender vibe, the amp was designed to deliver powerful tones without affecting one’s comfort when traveling. The unit is lighter and louder than many other amps offering more power at the same time. The Rumble amp measures 17.9 x 27.6 x 22.8 inches and weighs 36.5 pounds, which many musicians see as a leap forward in portability. Therefore, if you’re in need of a small guitar amp, this item might be the one to opt for. The versatile three-button voicing palette and the foot-switchable overdrive circuit render the item ideal for any gig. Other pro features the amp comes with include the 2 – 10″ speakers, XLR output, horn defeat, effects loop, and an additional 8-ohm speaker output. Another bass combo amplifier you might want to check before hitting the order button is the PB10 from Vox. Weighing just 12.32 pounds and measuring only 16.1 x 7.5 x 11.8 inches, this amp will go perfectly with travel guitars and on-the-go bassists. The dual-speaker unit was designed to amplify your sonic experience without requiring too much effort when traveling with it or carrying it from place to place. The amp features the Bass and Treble shaping controls as well as a Bright switch that will help the musician enhance the upper harmonics. If you want to fatten up the sound, you can use the Drive controls to dial in a soft bass distortion and enjoy that. The Headphone/Line output enables recording and private practice sessions. The Pathfinder Bass 10 sports a pair of 5″ VOX bulldog speakers that are powered by the 10-watt amp. The combo amp boasts the classic VOX design and feel. If you’re traveling a lot and you need a portable combo amplifier, this tiny fellow from Roland might be what you need. The Micro Cube model measures only 8.2 x 11.7 x 11.6 inches and weighs 14.99 pounds, which makes it ideal for travelers. Even if it boasts a micro design, there’s nothing micro about it when it comes to the features it offers. The 4-speaker combo sports eight different amps and that is probably a feature not many combo amps offer. Moreover, the unit houses a built-in tuner, six awesome effects, and a Rhythm Guide so you can keep time like a professional. The stereo AUX input allows the user to connect a CD/MP3 player and recording equipment. Another great thing about this amp is that it is powered by six AA batteries that will provide you with up to 13 hours of continuous use, which render it perfect for street gigs. With the Crush Bass 50 from Orange, you will get to shape your sonic experience with tones and features that only pros use. The 50-watt model was designed to deliver punchy and bold lows thanks to its ported cabinetry and analog circuitry. The flexibility of the active EQ section will allow the players to shape and customize their sound in endless ways. The Gain and Blend controls will help you create that full-range live sound by adding layers of harmonics and distortion to the bass core tone. Due to the optional FS-1 footswitch, you can engage these controls remotely. Housing a 12” speaker and a reflex port to enhance the low-end response, this combo amp ensures a rounded and fat sound thanks to the all-analog signal path. The headphone output will enable you to practice in silence whenever needed and even connect it to a console for accurate recording. Boasting features that will take your bass experience to the next level, this model from Orange will make a great addition to your musical gear if versatility, a stylish design, and a rich blend of specs are the things you’re on the lookout for. The EQ circuit the unit comes with is inspired by the well-known 4 Stroke Series amplifiers and has a parametric mid band at its center. This means the players will enjoy a greater control over their sound than when using a traditional EQ and they will also be able to vary the frequencies they are interested in. The amp can be fine-tuned to suit many musical styles and can be used even with a beginner bass guitar given the flexibility it offers. The Gain and Blend controls will enable you to add extra harmonics and distortion to the core bass tone. The fat, rounded sound delivered is possible thanks to the all-analog signal path. Designed to meet the needs of both professional players and beginners, the Max 115 Bass Combo Amplifier from Peavey is another product you might want to check before making a decision. This unit won’t just help you take your sound closer to a superior level but it will make it comfortable for you to take it when traveling given its weight. Although 52 pounds might seem not that light to some people, in the world of amps, that is still a decent weight considering the sonic benefits a player can enjoy by using such a product. The 300-watt amp comes with a 15-inch heavy-duty woofer and DDT speaker protection. The EQ section features Punch, Mid-shift, and Bright controls and a 3-band EQ. The unit also sports a built-in chromatic tuner, 1/8″ jacks for phone output and aux input as well as XLR direct output with ground lift. If you’re an advanced player and the field of amps holds little mystery to you, you’ve most probably heard of the legendary bass amps from Gallien-Krueger. If one of its products is what you have in mind, you might want to try the MB112-II model for a sonic boost and a light build. Featuring a 12” Paragon Speaker, the 200-watt unit was designed to deliver a big sound through a light compact construction that weighs 34 pounds and measures 15 x 15 x 17 inches. Its dimensions render it thus ideal for bassists on the go. This grab ‘n’ go bass combo amp comes with a Chain Out that will enable the user to connect the unit to an MBP-powered enclosure so the musician can increase the volume for larger venues. The unit also features a 4-band active EQ and a gain control in order for the player to dial in the ideal amount of grit. No matter the level of bass playing you’ve reached, the Promethean model from Ibanez is worth considering when interested in a bass combo amplifier. The 20W unit features simple controls so any musician can use it with ease. Engineered to help you shape your sound, this bass combo amp is also ideal for bassists traveling a lot with their musical gear. The item weighs only 19.6 pounds and measures 15.2 x 14.5 x 13.8 inches. It is one of the most portable amps you will find on the market. Loaded with a single 8-in. driver, the unit features a 4-band EQ to enable the user to shape the tone with ease. Thanks to the aux input and headphone output the bass features, you will be able to play along with your favorite songs and practice in silence whenever needed. Furthermore, the -10dB pad will accommodate basses with active pickups. If a high power and a lightweight design are the things you want from your amp, the HMKB12 model from Hartke shouldn’t go unchecked. The product was created to provide players with a serious bass tone that will cut through the mix yet with a portable build that will make it easy and comfortable for the musician to carry the unit from place to place. The amp weighs only 26 pounds and measures 20 x 17 x 18 inches. With such dimensions, adding this tiny music-enhancer to your gear won’t require too much of your effort. Kickback KB12 delivers 500 watts of Class D power and features the Hydride Speaker Technology. The amp is a new and improved version of the Kickback 12 Bass Combo that many users appreciated for its overall quality and performance. The 2-way cabinet design of the unit will allow you to use it in the upright or kickback position. Combining a lightweight design with user-friendly features and high power, the USM-EC8-U model from Eden should not be ignored if you want to enjoy a killer tone without breaking the wallet. The unit is ideal for semi-professionals, intermediate musicians, and pros on tours alike. The item is extremely portable reaching a weight of only 11 pounds and measuring 10.5 x 8.5 x 12.6 inches. This renders it ideal for touring players. Committed to providing excellent tone crafting, the amp houses an 8″ 35W Speaker as well as Stereo / Media Input and Headphone Output that will enable you to play in silence without disturbing the people around you. The product also boasts a 3.5mm jack socket for MP3 or other device connectivity. The user gets a single tone control with Eden “Enhance” EQ sweep. The cabinet design ensures great response and efficiency. Another space-saving unit to consider when looking for a new bass combo amp is the MAX 115 model from Peavey. The product was designed to deliver more bass without affecting the players’ comfort when traveling with their gear. The item measures 27 x 14.8 x 22 inches and weighs 21 pounds, dimensions that render the amp ideal for touring bassists. Thanks to the exclusive HyperVent technology used, the amp will push the bass through specially engineered ports that will allow excellent woofer response. The item delivers 60 Watts of power and comes with a D 15-inch heavy-duty woofer and DTT speaker protection. The patented TransTube circuitry allows the user to choose from three separate voicings that include MAX, Vintage, and Modern. As expected, each option emulates a distinctive sound so you can enjoy versatility and customize your sonic experience according to your preferences and musical personality. Whether you’re a beginner or an advanced player in need of a good bass combo amp, the market offers many products to meet various needs and levels. Finding the best combo amplifier for bass guitars, though, might not be that easy considering the various features such products come with and the different models available on the market. 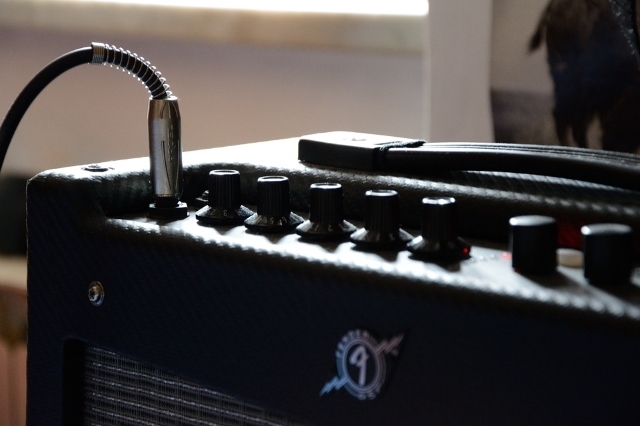 Even if your budget won’t allow you to get something expensive and you’re on the lookout for a cheap bass combo amp, there are some factors you need to consider in order to simplify your shopping process and get an amp that will serve your needs. Here are the main specifications you might want to bear in mind when looking for a bass combo amp. The market offers solid-state and tube amps that meet different needs. If you want a high-power bass amp that won’t empty your pockets, you might want to consider a solid-state amp. A tube amp is generally more expensive and even more fragile. The thing with solid-state amps is that they play loud and the distortion created might not be that musical when they reach their upper limits. Tube amps, although costlier, will get you a cleaner and more pleasing overdrive. However, many solid-state amps were designed in such a way to have enough headroom and thus avoid overdrive. Bass amp combos or head and cabinet? Just like when you’re on the lookout for a phaser pedal, an octave pedal to try something new, or bass pedals to flavor your music according to your musical mindset, one of the first things to use as a filter is the sort of practice you need the product for. If you intend to go for small studio gigs or just home practice, then an all-in-one combo amp should be enough. A bass combo amp integrates the speaker(s) and the amp into a single cabinet so you don’t have to worry about cabling and component-matching issues. A properly engineered amp/speaker combo with a closed back should play loud enough for small and medium venues. In case you will play in large halls and open arenas, you will need a high-powered head that is matched with a single or double cabinet. Another aspect that will help you decide which model to go for is the size of the speaker integrated into the combo amp. Bigger doesn’t necessarily mean better. This depends on the sound you prefer. There are bassists that prefer the sound of several speakers in one cabinet whereas others prefer two large speakers instead. The difference is in the sound the speakers will get you. Therefore, a greater number of smaller speakers in a cabinet will create a more accurate sound. With a single larger speaker, the sound gets a bit heavy, even mushy. The market offers various speaker cabinet combinations. The most popular ones for bass players include the 4 x 10″, 1 x 15″, 1 x 18″, and the 8 x 10″ combinations. Again, the type of sessions you will engage in and the venue you choose for your gigs will help you decide which combination to choose. In case you will use the amp just to practice, a 100-watt unit should do. For sessions that are more than practice, you should keep in mind that low frequencies will draw lots of power to move big speakers back and forth. In this case, you might want to consider a 200- to 400-watt amp. It’s not uncommon to see even 500-1000 watt amps, though. Besides the fact that bass guitar amplifiers require so much power to reproduce low frequencies at high volumes, bass amps come with a higher power rating to ensure clean headroom. Bass players generally prefer cleaner tones. With a high-wattage amp, you can achieve a clean tone even at incredible volumes and still have great control over your sound. However, a higher power rating is usually required for large venues. Another feature to keep in mind when looking for the best bass combo amplifier is the number of channels. If you get a model that comes with dual channels, you will have the possibility to set up two different EQ and effects chains and then switch between them with ease. In case you want internal overdrive, it is best to go for an amp that comes with two gain controls to allow you to control the distortion amount and volume. You will find EQ that is either a simple 3-knob tone control or a more sophisticated graphic or parametric model. If you travel a lot and you want a bass combo to keep up with that, then you need to pay attention to portability. Thanks to the latest achievements in this field, it is now possible to enjoy the benefits of an amp even when on the go without your comfort being affected. You will find many models that come with specs even pros look for in a lightweight compact unit. Some of the amps we have showcased above are ideal for touring players or users interested in taking their musical gear with them when traveling. There are models that weigh only 20 pounds or so. Don’t forget about the materials used and their durability. A bass cabinet will vibrate more than other cabinets and this calls for a solid build as well as a thicker wood. Metal corners and speaker screens are also recommended given that certain amps are heavier and thus roughly handled.